Audi, the German car maker has launched the facelifted version of the most desirable SUV Q3 in India. This sports utility vehicle has received some noticeable changes to both its exteriors and interiors. 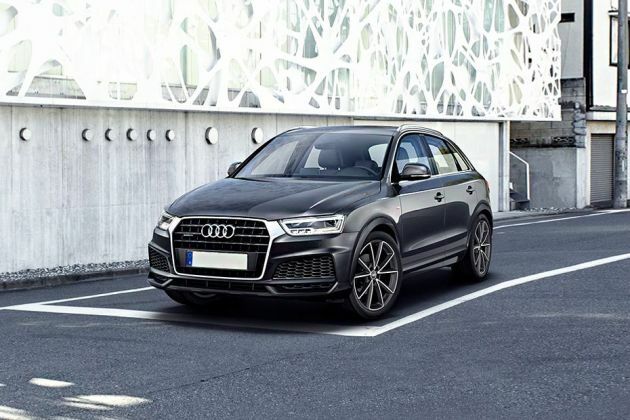 Currently, it is available sold in three trim levels, among which Audi Q3 35 TDI Quattro Premium Plus is the top end variant. Mechanically, the vehicle remains the same and fitted with the 1968cc diesel engine. It is paired with a 7-speed S-Tronic automatic gear box that helps the engine to deliver a power packed performance. In terms of style, the company made has made some sizable modifications to its front fascia. It gets a refined single frame radiator grille and headlight cluster with LED lamps. Other changes includes restructured bumpers, a set of brand new alloy wheels and slightly revised taillights. The changes are also made to the internal cabin to render a classy appeal to the interiors. These include new accents for dashboard including door trims, color display for instrument cluster and 3D aluminum inlays. Beside these, its gets an updated Audi MMI system with two SD card slots, navigation system and 20GB hard drive storage capacity. On the other hand, the company is offering this vehicle with a standard warranty of two years or unlimited Kilometers. This vehicle will compete against the likes of Mercedes Benz GLA Class, and BMW X1 in the entry level luxury SUV segment. The exteriors of this trim are finely crafted and modified, down to the smallest detail. Its front faÃ§ade is re-designed and fitted with a single frame chrome accentuated radiator grille. The headlight cluster surrounding this gets all LED headlamps along with signature DRLs, which is the main attraction for this SUV. The updated front bumper has a masculine structure and it is equipped with a pair of air ducts. Furthermore, it comes fitted with a protective cladding, which gives an aggressive look to the front. The large windscreen is made of heat insulating glass and accompanied by a couple of wipers. On the sides, it has neatly crafted wheel arches that have been fitted with a set of stylish aluminum alloy wheels. These rims are covered with high performance tubeless radial tyres that give a superior road grip. Its door handles as well as the external wing mirrors are in body color, while window sill have chrome surround. The B pillars with black sash tape give the side profile a decent appearance. Coming to the rear end, it has modified taillight cluster that comes incorporated with signature LED light pattern. Its tailgate hosts a license plate console along with a chrome plated company's insignia. The rear windscreen is quite large and is accompanied by a spoiler featuring high mounted stop lamp. The insides are enchanting with a dual tone color scheme and aluminum door sill trims. The cabin is quite roomy and can accommodate five passengers with ease. It is made with high quality scratch resistant materials and accentuated by and chrome inserts. The cockpit has a neatly crafted dashboard that is beautifully decorated with 3D aluminum mesh inlays. It is further equipped with an advanced AC unit, infotainment system, an instrument panel and several other utility based features. The cabin is furnished with ergonomically designed seats wherein, the front seats are electrically adjustable and features 4-way lumbar support. The rear seats are bestowed with 60:40 split folding function, which helps to improve boot storage space. These seats have been covered with good quality leather upholstery. The company has fitted several utility based features inside like cup holders, sun visors with illuminated vanity mirror, storage compartment, cooled glove box, interior mirror with automatic anti-glare action and numerous other such aspects. This variant is powered by a 2.0-litre in-line diesel engine that comes incorporated with exhaust-gas based turbo charging unit. It comes with a DOHC based valve configuration featuring 4-cylinders and it can displace 1968cc. This diesel motor has the ability of churning out a peak power of 174.3bhp at 4200rpm that results in a commanding torque output of 380Nm in the range of 1750 to 2500rpm. The company has paired this mill with a 7-speed S Tronic automatic transmission gear box, which transmits the torque output to all four wheels via quattro permanent all wheel drive technology. This variant can reach a top speed of around 212 Kmph. On the other hand, the engine helps the vehicle to deliver a mileage of 15.73 Kmpl. All the wheels have been equipped with a set of high performance disc brakes and this mechanism is further assisted by ABS along with electronic brake force distribution and emergency brake assist function. Furthermore, it comes incorporated with an advanced electronic stabilization program that regulates the braking of each wheel and keeps the vehicle stable. On the other hand, its front axle is fitted with a McPherson Strut type of system along with lower wishbone and aluminum sub-frame. While its rear axle is assembled with 4-link type of mechanism featuring separate spring/damper arrangement and sub-frame. It is incorporated with a speed sensitive electromechanical power steering, which makes it easy to handle even in peak traffic conditions. This top end variant is blessed with a lot of sophisticated comfort features, which gives the passengers a luxurious driving experience. It comes with an advanced automatic air conditioning system that keeps the cabin cool irrespective of temperature outside. It has a driver information display with 3.5-inch TFT monochrome display and it features a lot of functions. Apart from these, it is equipped with an upgraded infotainment system with 20GB hard disc capacity. Beside these, there is a Bluetooth interface, concert radio, voice dialogue system, 4-way lumbar support for front seats, engine start/stop function, cruise control and many other such aspects. This sports utility vehicle is incorporated with driver and co-passenger airbags along with front and rear side airbags that helps to minimize injuries in case of any accidents. It is also equipped with a central locking system with an advanced engine mobilizer, parking sensors that help the driver, while parking the vehicle. In addition to these, it has space saving spare wheel, first aid kit with warning triangle, tyre pressure monitoring display and an electronic vehicle immobilization device. 1. Presence of advanced quattro technology is a big plus point. 2. Comfort features are at par with other competitors. 1. Presence of service network needs to improve. 2. Cost of ownership and spares can be made competitive. ముందస్తు భద్రతా లక్షణాలు"Emergency Road Side Assistance Services,Head Airbags, Side On Collision Protection, First Aid Kit With Warning Triangle, Electronic Differential Lock (EDL), Electronic Stabilisation Control (ESC), Wheel Selective Torque Distribution, Anti Theft Wheel Bolts, Space Saving, Spare Wheel, Vehicle Tool Kit, Electromechanical parking brake, Side-on collision protection "
Speed Sensing Auto Door Lock "
ఆడి క్యూ3 5 వేర్వేరు రంగులలో అందుబాటులో ఉంది - Misano Red, Cortina White, Hanian Blue, Floret Silver Metallic, Mythos Black. జూన్ రెండవ వారంలో విడుదల కి సిద్దమవుతున్న అప్ డేటెడ్ "ఆడి క్యూ3 ఎస్ యువి"